West Bengal Chief Minister Mamata Banerjee launched a slew of developmental programmes for her state in a ceremony at Nadia district on Tuesday, 13 February. 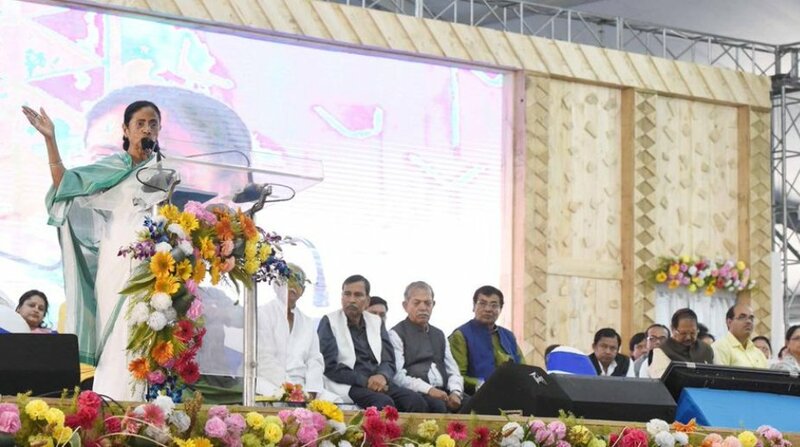 Before hundreds of supporters at a programme in Krishnanagar, Banerjee announced the state-wide construction of nearly 13,000 km of new rural roads to connect parts of Bengal and ensure better connectivity with state and national highways. She claimed that the construction of 35,000 kms of roads would be completed by December 2019. The work of laying new roads will be undertaken by the panchayats and rural development department. Besides road construction, the CM laid the foundation stones for power sub-stations, water supply projects, and blood banks. She also inaugurated bridges, youth hostels and schools. At the same time, Banerjee attacked both the Left and the BJP for neglecting the state for years. She claimed that while the Centre spent Rs 100 crore on ‘Beti Bachao Beti Padhao’, her government spent Rs 5,000 crore for Kanyashree. She accused the BJP-led government at the Centre of destroying the economy in the name of demonetisation and GST. “The government is planning to bring FRDI Bill. Your savings will no longer be safe in banks. This will give rise to chit funds. Where will the poor people go? What will farmers, labourers, workers do?” she asked. “The Centre has stopped funds for ICDS and ASHA workers. But now we are running these projects with our own funds,” she said. While highlighting the policies undertaken for uplifting the poor, Banerjee said that her government will soon hand over land pattas to refugees. Exhorting people to ensure peace and not pay heed to the “communal BJP”, Mamata claimed that the saffron party is “an aberration in the name of Hinduism”. “They (the Centre) should take lessons from Bengal as regards what we have done for the farmers,” Banerjee said. At the programme, the Chief Minister distributed benefits under schemes like Kanyashree, Sabuj Sathi, Anandadhara, Gatidhara, and gave away land pattas, Kisan Credit Cards and other benefits. Banerjee also met Alfred Ford, the great grandson of Henry Ford, at ISKCON temple in Mayapur and requested him to consider setting up Ford Motor Company’s manufacturing unit in the state. “I have requested Mr Ford (Alfred Ford) to plan a new manufacturing unit here in West Bengal. They have one in Chennai. He said he will look into it,” Banerjee said.